The British Red Cross have announced that they are to provide a mobility aids loan service in Totton & Romsey. Last year, the much valued local service provision which includes loan of mobility equipment such as wheelchairs and walkers was scrapped as a result of a decision by NHS Property Services to charge the British Red Cross commercial rates for the properties it was using. The news was devastating to the team of volunteers who had provided the service for many years and for all potential users who much value the service which isn’t a statutory duty provided by the NHS. 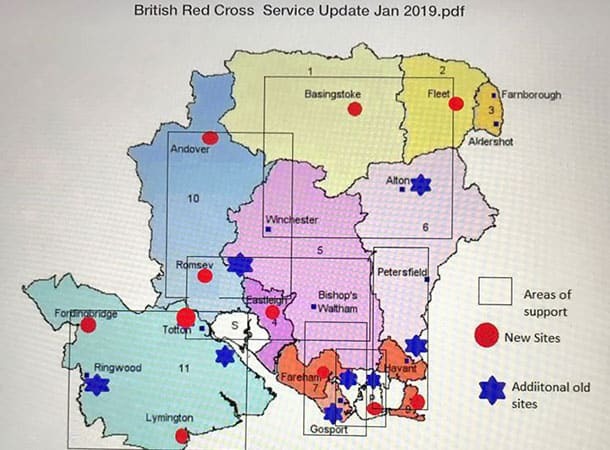 Totton’s Town District & County Councillor, David Harrison, took up the campaign to see if the service could be saved, publicising a local petition, getting the support of the Director of Health & Adult Services and lobbying bosses at the British Red Cross. It was feared that residents of Totton and Eastleigh would have to travel as far afield as Lymington or Eastleigh to access the service. However, the British Red Cross have now announced an intention to provide a mobile pop-up service on particular days in both Totton & Romsey. David Harrison says “This is very good news. I totally understand why the British Red Cross, a charity, wasn’t able to pay commercial rates to operate from a building. The most important thing is that residents in both Totton & Romsey will now be able to easily access the service. I would like to thank everyone who signed the petition and supported the campaign”.